Hundreds of people lined the streets of Soweto on Friday to see the funeral procession of Winnie Mandela ahead of her final send-off this weekend. A black hearse carrying the body of Mandela, one of the most divisive figures in the anti-apartheid struggle, slowly drove to her house led by uniformed men bearing the flag of her African National Congress (ANC) party. Mandela, who died in Johannesburg aged 81 on April 2 after a long illness, was celebrated for keeping her husband Nelson Mandela’s dream of a non-racial South Africa alive during his 27-year imprisonment. “There were times when people could not afford a funeral and she would assist,” said neighbour Gloria Searole, 31, a service consultant who went to catch a glimpse of the procession along with her daughter. South Africa’s new President Cyril Ramaphosa, who took office two months ago, will lead the mourners at a pre-burial service due to start at 0600 GMT on Saturday at Soweto’s 37,000-capacity Orlando stadium. American civil rights activist Jesse Jackson is expected to attend, as are the presidents of Namibia and the Republic of Congo. 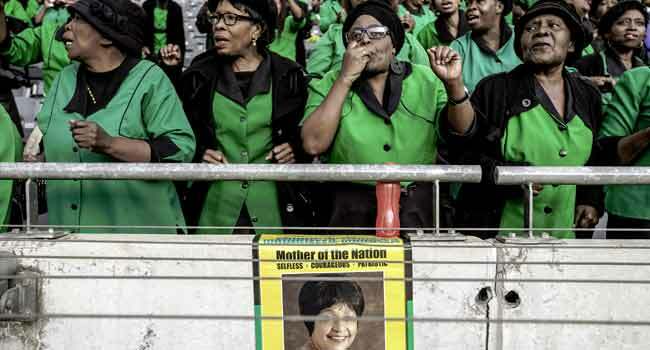 “She is truly the mother of South Africa,” Jackson told journalists on Friday. The township of Soweto is hugely symbolic in South Africa as it became a crucible of black resistance to white minority rule which ended with elections in 1994. Mandela’s husband became the first black president of democratic South Africa, but she refused to follow many other struggle-era politicians who moved from townships like Soweto to formerly white-only suburbs after the end of apartheid.